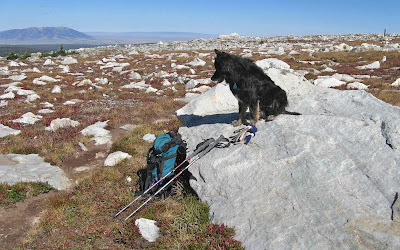 My old friend Sparky, on an early Proterozoic beach in southeast Wyoming. West of Laramie, Highway 130 crosses the rolling grasslands of the valley bottom for about 30 miles and then begins to climb, winding up through the Medicine Bow Mountains, through conifer forest and quaking aspen, past meadows and small lakes, past streams lined with yellow, blue and red wildflowers. 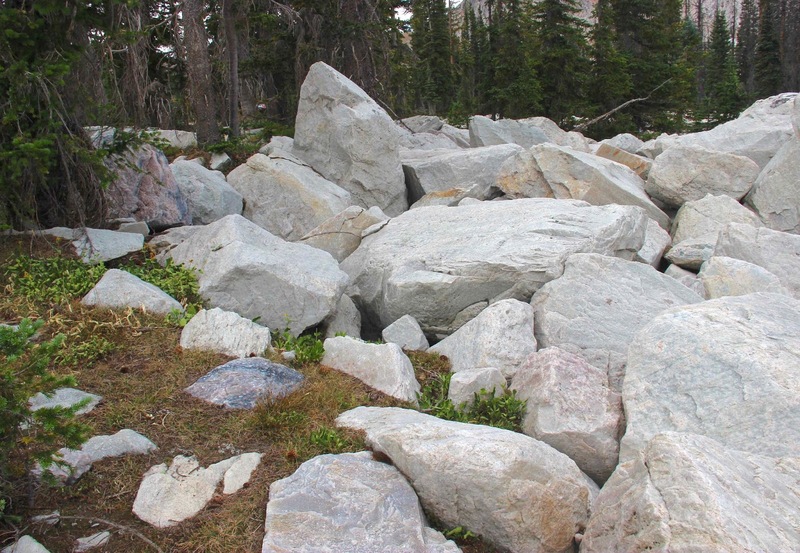 Polished boulders lie scattered about, sparkling in the sun. For ten miles the road climbs. The meadows get bigger, the trees smaller. There are more and more boulders and outcrops until finally the landscape is dominated by rock. 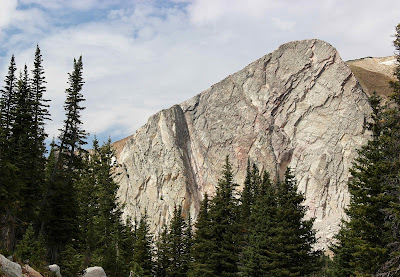 Most prominent is the Snowy Range—a wall 1500 feet high and seven miles long—a beach turned on its side—5600 feet of sand transformed into rock. In 2014, the US Forest Service installed geological interpretive signs, designed by the Wyoming Geological Survey, at the high point of Highway 130. No longer are we limited to today’s scenery. 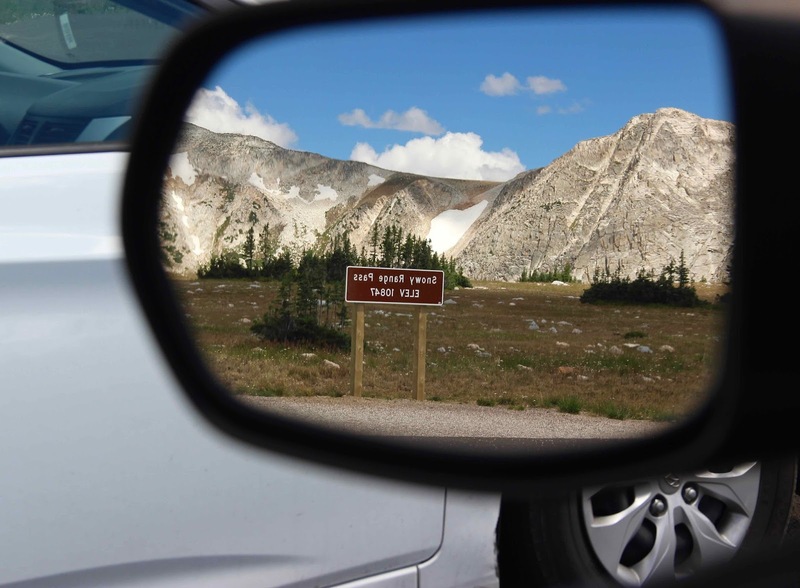 Now we can view the Snowy Range in deep time—two billion years ago!—and appreciate the Earth’s awesome powers. 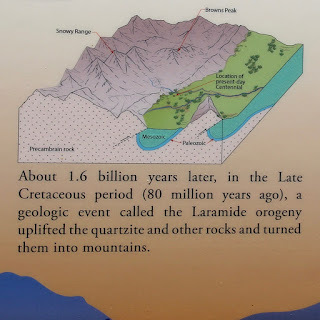 If we were to travel in time as well as space, and visit southeast Wyoming two billion years ago (early Proterozoic time), we would be standing on the southeast coast of a young North America. Looking northeast, we would see mountains in the distance. 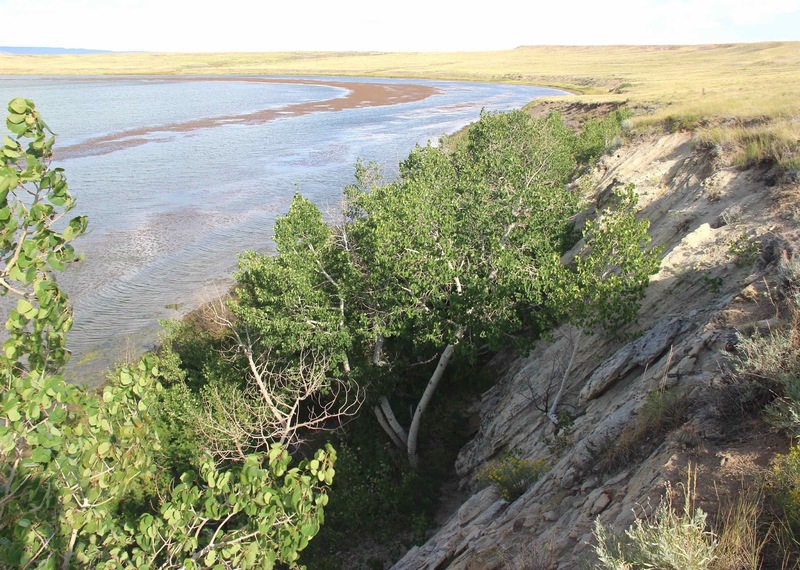 Erosion was rapidly wearing them down, being unimpeded by vegetation (land plants wouldn’t appear for another 1.5 billion years). Streams carried massive amounts of debris to the coast where they dropped their loads, building deltas and beaches. Of course this tranquil coastal scene was not to last, the Earth being what it is—dynamic. 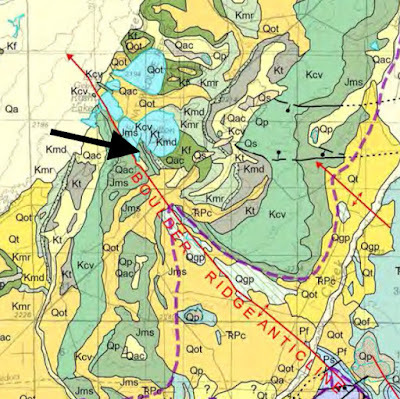 A few hundred million years later, a drifting continental fragment or several island arcs bumped up against the coast. A collision of this scale has serious repercussions. The beds of sand—by now lithified into sandstone—were deformed into large steep folds. 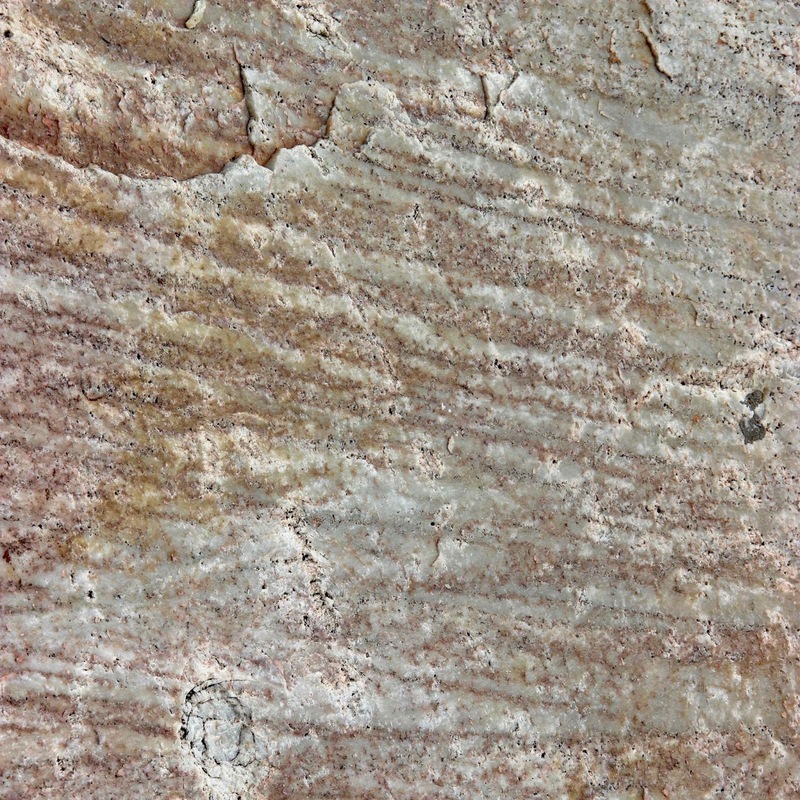 Immense pressure and heat transformed the sand to very durable quartzite. The landscape must have been spectacular, maybe similar to the Himalayas or Andes. But it too was ephemeral and soon gone—worn down and buried under younger sediments. 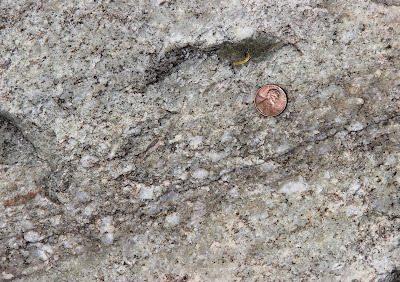 The quartzite would lie hidden from view for something like 1.5 billion years. 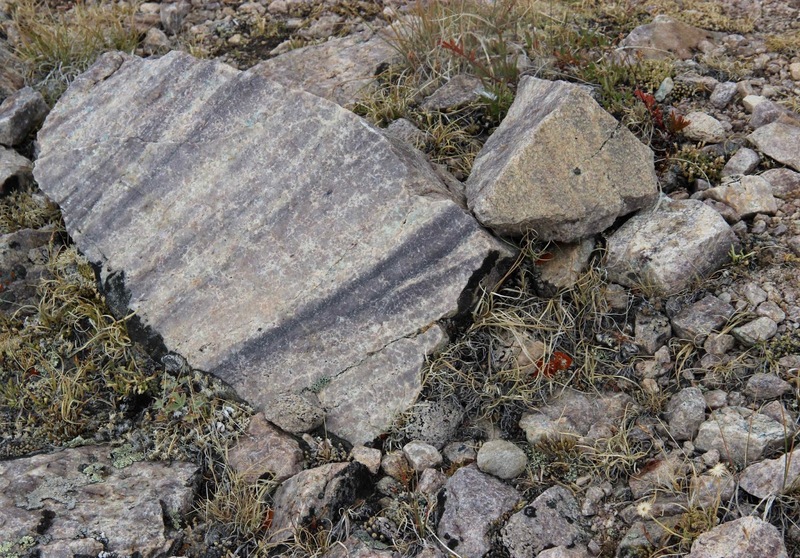 Then once again the land was shoved up and folded, during the widespread deformation that created the Rocky Mountains 70 to 40 million years ago. 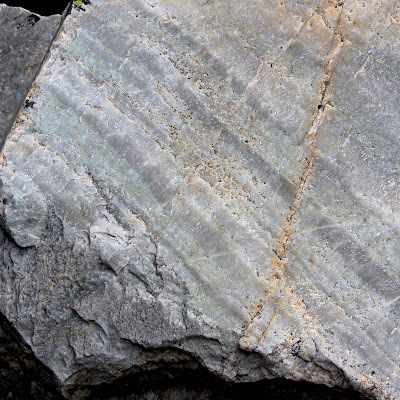 Erosion went to work immediately, as it does whenever mountains are uplifted, and the younger sedimentary strata were worn away to reveal rocks that came to be two billion years ago along that ancient coast. So let’s go beach-combing! Emmie is fascinated by early Proterozoic rocks. We won’t find any shells or seaweed or dead fish on this beach—two billion years ago was much too early for complex life—but our beach-combing will still be productive. Even though the quartzite is quite ancient, the metamorphism was low-grade (“only” 200-300º C), so structures and features of the original sand deposits are still visible! 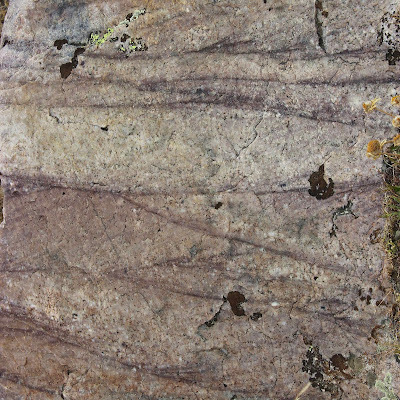 These are some of the clues geologists use to reconstruct the environment here two billion years ago (of course they don’t always agree). 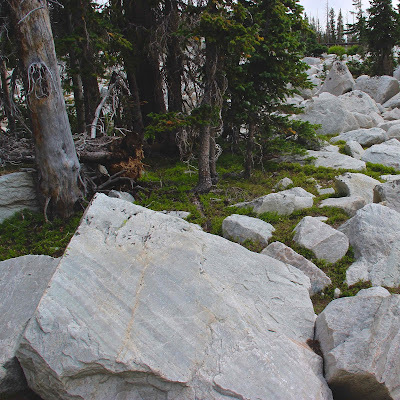 The Snowy Range is mostly Medicine Peak quartzite, which is highly resistant to erosion. That’s why the Range stands above the rest of the Medicine Bow Mountains. Original beds (layers) are still visible (left of center, beyond lake; click on image for a better view). 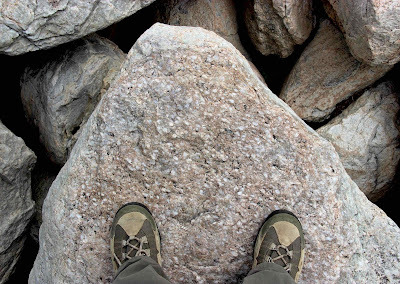 On the west side of Mirror Lake, beds of sand-turned-to-rock are tilted to nearly vertical. Fine-scale sedimentary structures are common—such as bedding, cross-bedding, and layers of pebbles. Various minerals add color. 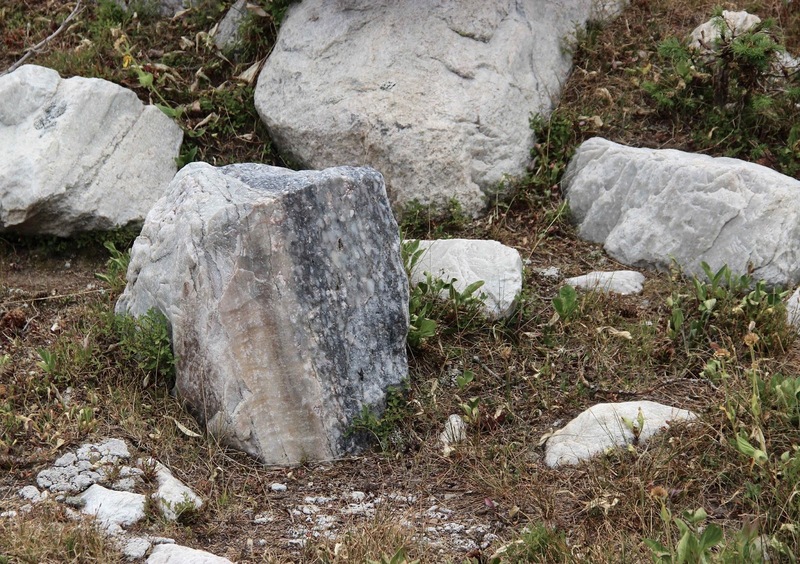 Much of the rock is polished, for as recently as 12,000 years ago, glaciers were grinding their way across this area. Beauty combined with views into an ancient world keep me looking at rock after rock after rock. 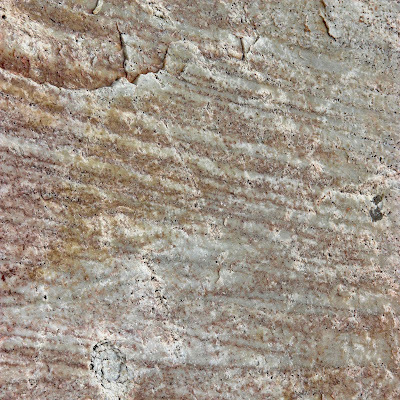 Often the quartzite appears striped—showing layers of sand deposited at different times, under different conditions, or maybe from a different source. Cross-bedding is common in places. 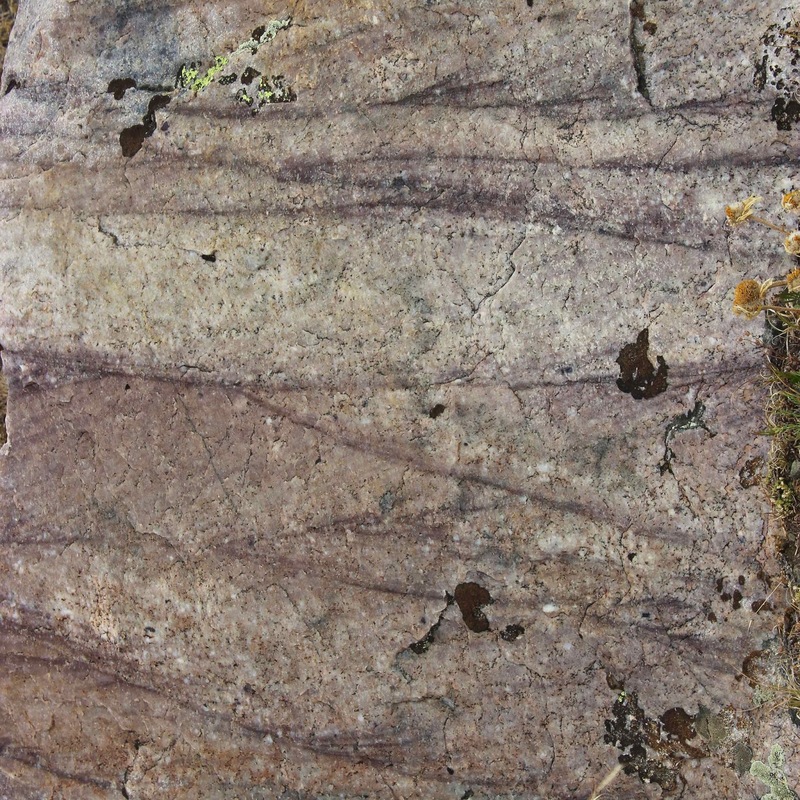 The scale of the beds indicates this sand was deposited by water, perhaps in a river or subtidal delta (vs. large scale cross-bedding created by wind, as in dunes). Medicine Peak quartzite includes occasional layers of quartz pebbles, sometimes enough to qualify as quartz pebble conglomerate. Pebbles need more vigorous transport than sand; maybe they were deposited when streamflow was high. 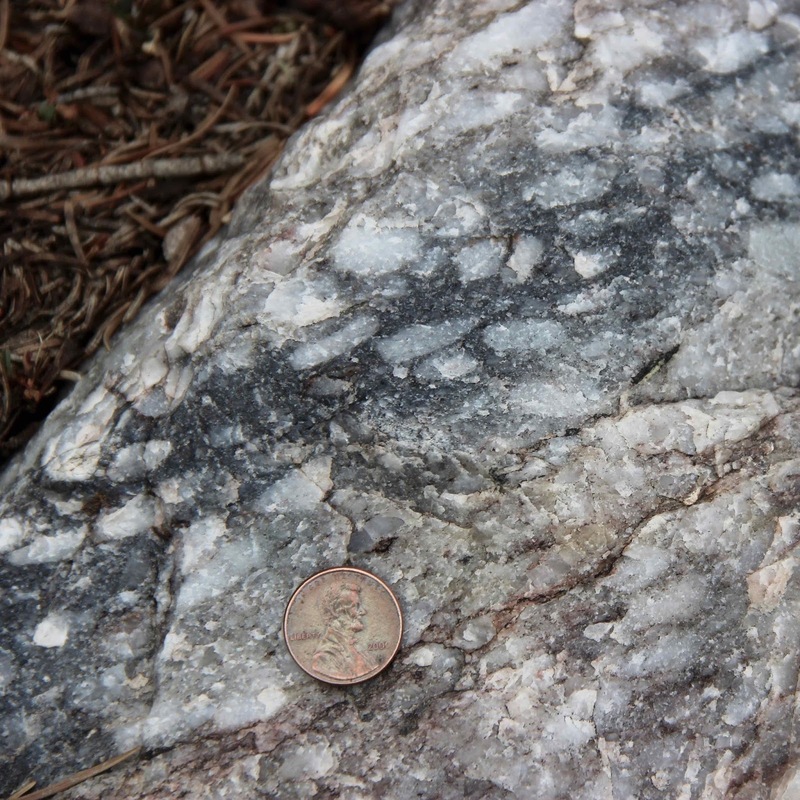 Arrows point to a pebble layer in cross section. An even better one!! It's so hard to quit searching ... just like in beach-combing. The Snowy Range is about 45 miles west of Laramie, via Wyoming Highway 130. Stop at Libby Flats and the overlook to the west for great views, invigorating mountain air, and a healthy dose of geological edification. Snowy Range in the Medicine Bow Mountains. 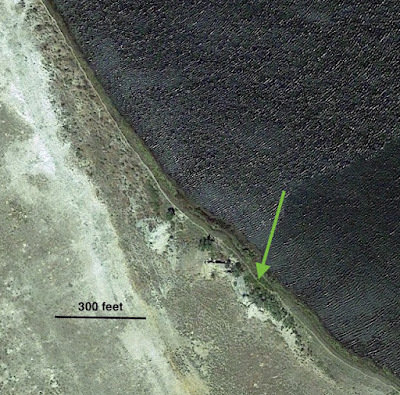 Arrow marks pullouts with geological signs (Google Earth). Hausel, WD. 1993. 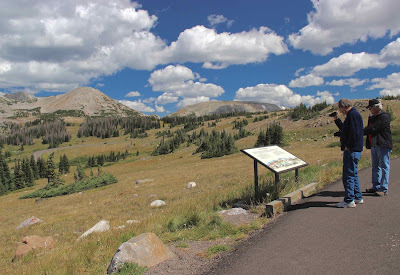 Guide to the geology, mining districts, and ghost towns of the Medicine Bow Mountains and Snowy Range Scenic Byway. 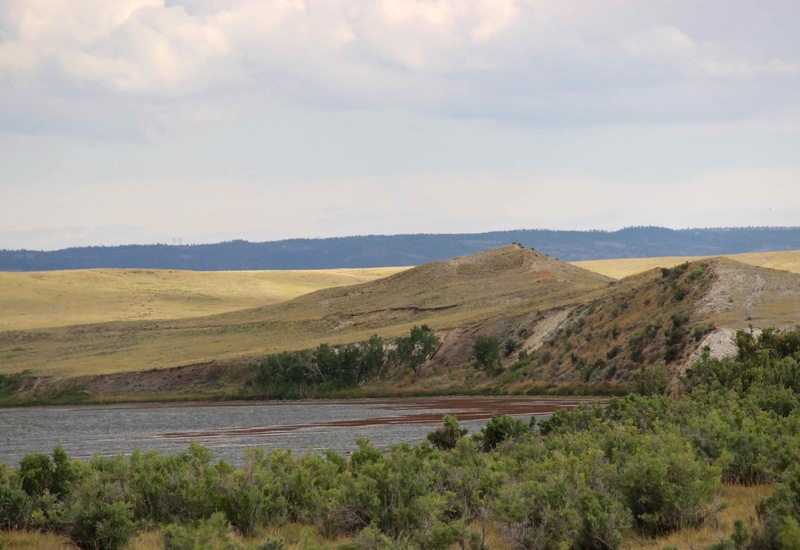 Wyoming State Geological Survey Public Information Circular No. 32. Karlstrom, KE, and Houston, RS. 1984. 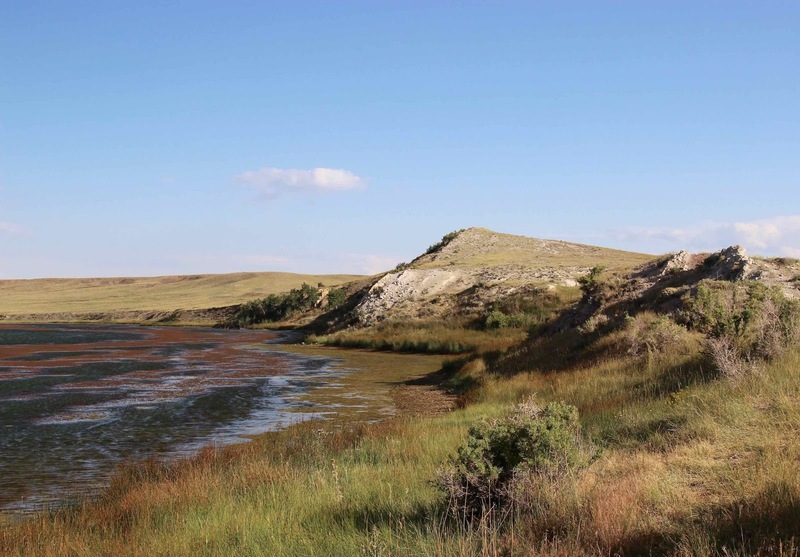 The Cheyenne Belt; analysis of a Proterozoic suture in southern Wyoming. 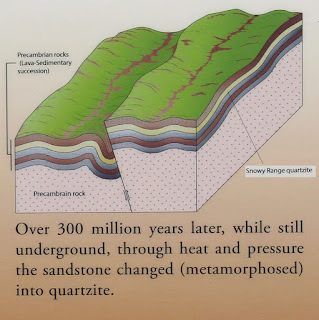 Precambrian Research 25:415-446. Lanthier, LR, 1979. 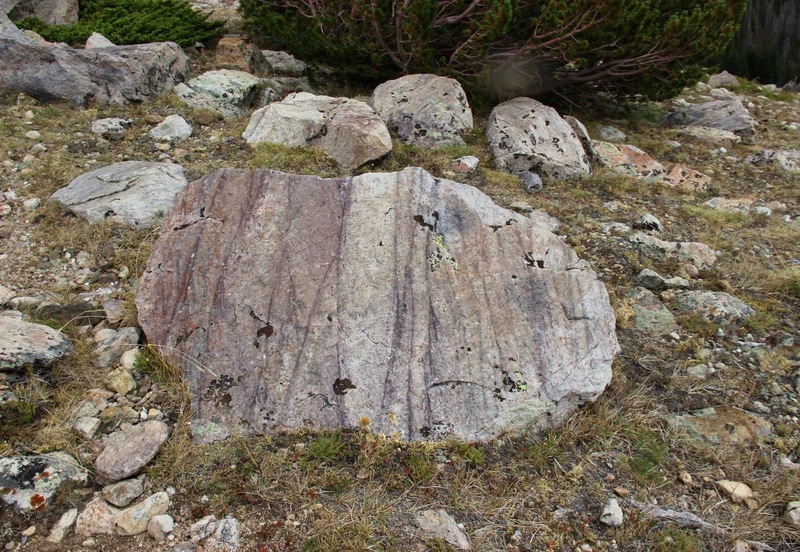 Stratigraphy and structure of the lower part of the Precambrian Libby Creek Group, central Medicine Bow Mountains, Wyoming. 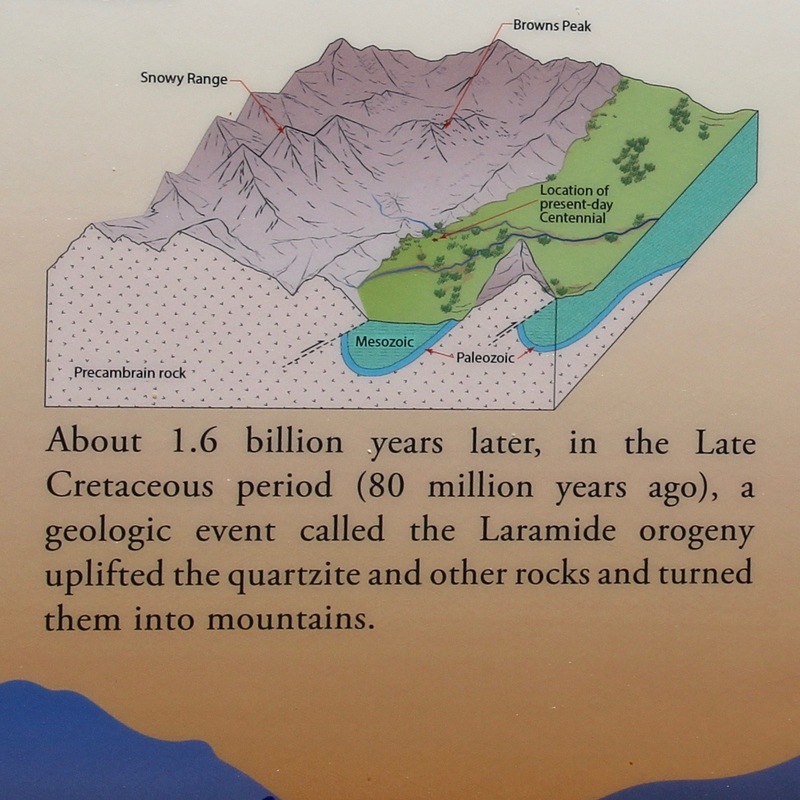 Contributions to Geology, University of Wyoming. 17:135-147. Mears, B, Jr. 2001. 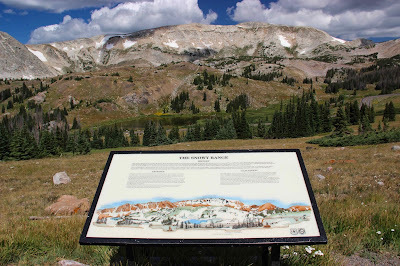 Glacial records in the Medicine Bow Mountains and Sierra Madre of southern Wyoming and adjacent Colorado, with a traveler’s guide to their sites. 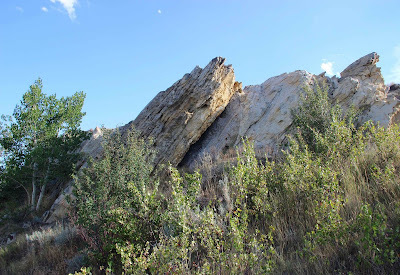 Wyoming State Geological Survey Public Information Circular No. 41. I awoke in the middle of the night to a powerful fragrance emanating from the kitchen—a mix of jasmine and wintergreen and the benzyl benzoate beloved of veterinarians. I didn’t notice the abundant nitrogen-bearing compounds, for their disgusting stink was masked by perfumey scents and sharp animalic notes. But I should be clear—only later would I learn these details. At the time, I only recognized the thick sweet yeasty smell of Nuttall's evening primroses in bloom. True to their name, evening primroses open at dusk. 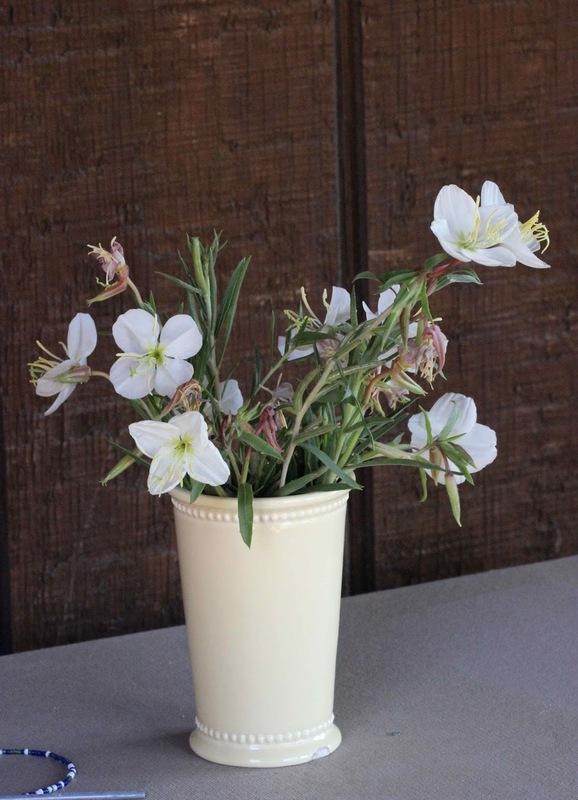 Nuttall’s evening primrose is well-suited to dim light, with a strong fragrance that lures pollinators to a large white target, where they’re rewarded with nutritious nectar. While sipping the nectar, the visitor inadvertently picks up pollen, and hopefully carries it to the receptive stigma of another evening primrose of the same species—leading to fertilization, seed production, and the perpetuation of life. 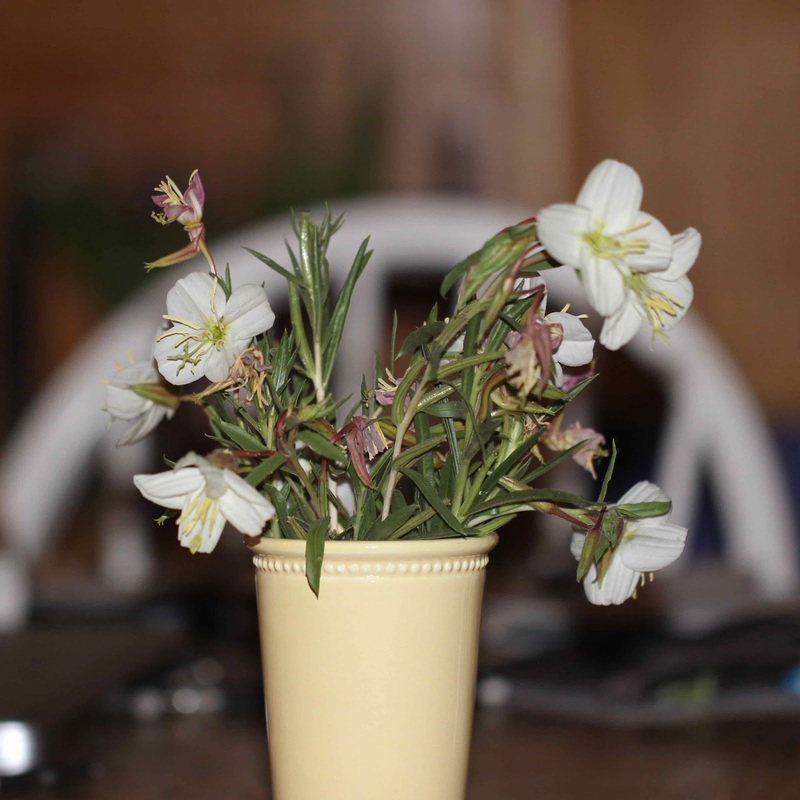 The evening primroses in my kitchen were collected from a nearby abandoned railroad. I brought them home intending to make macro portraits, but I waited too long. The petals wilted and turned pink, signaling “all done.” Other flowers were waiting in the wings, however—folded and rolled up in their buds. 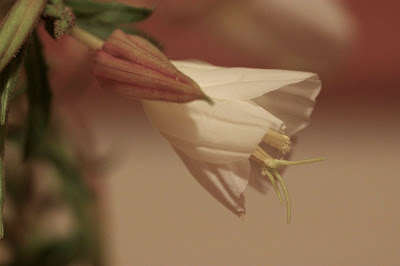 They bloomed that night, filling my kitchen with their potent scent. 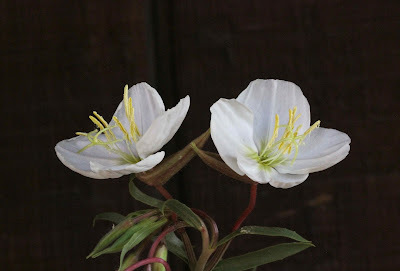 After a few photos, I took them outside to the woodshed, leaving the door open for any pollinators that might be around. This flower’s clearly finished, being pink. Pollinators, you might as well look elsewhere. The flowers remained open for several hours that morning. Inside the shed, they stayed still enough for the macro portraits I had hoped for. 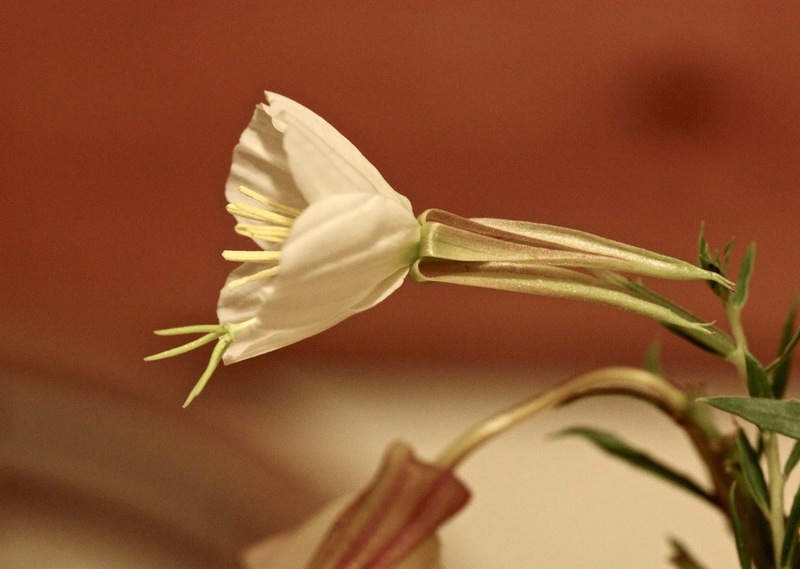 The petals are highly reflective, and release aromatic compounds—terrific advertising. There really is yummy nectar down in this hole! 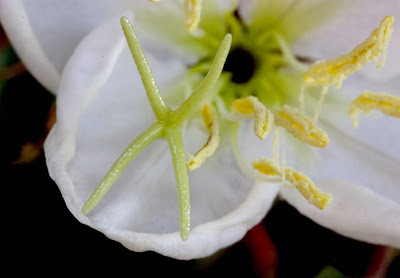 Evening primrose pollen comes in strings, held together with viscin threads. Most online sources define “viscin” as a product of the mucilaginous sap of mistletoe, but there's more to it. In some plants, including orchids and evening primroses, pollen grains are held together with clear elastic viscin threads. More info here and here. 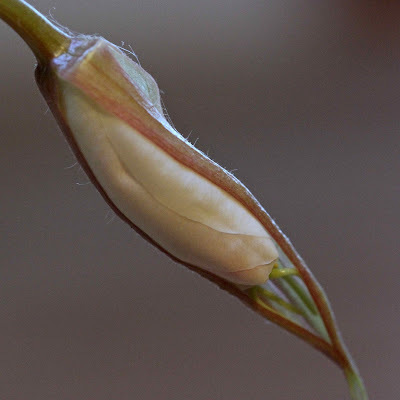 Viscin threads and pollen grains hang from anthers. Note extended 4-lobed green stigma. 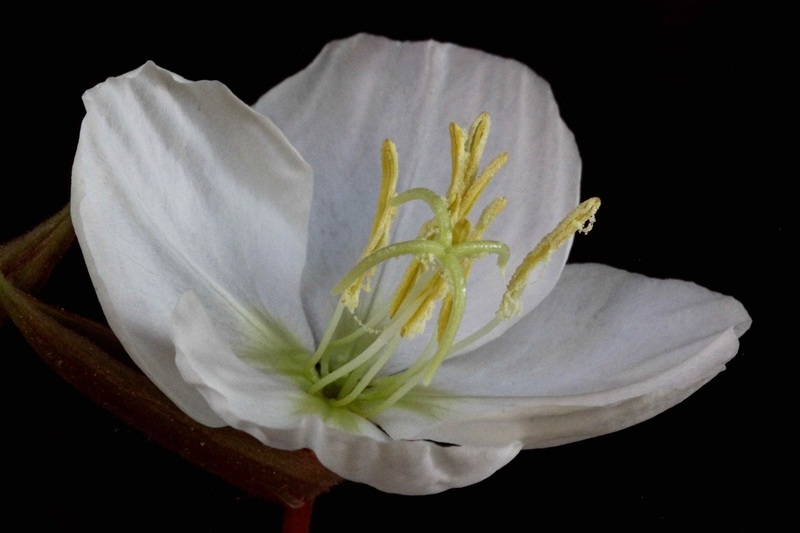 Oenothera nuttallii is thought to be an outcrosser. 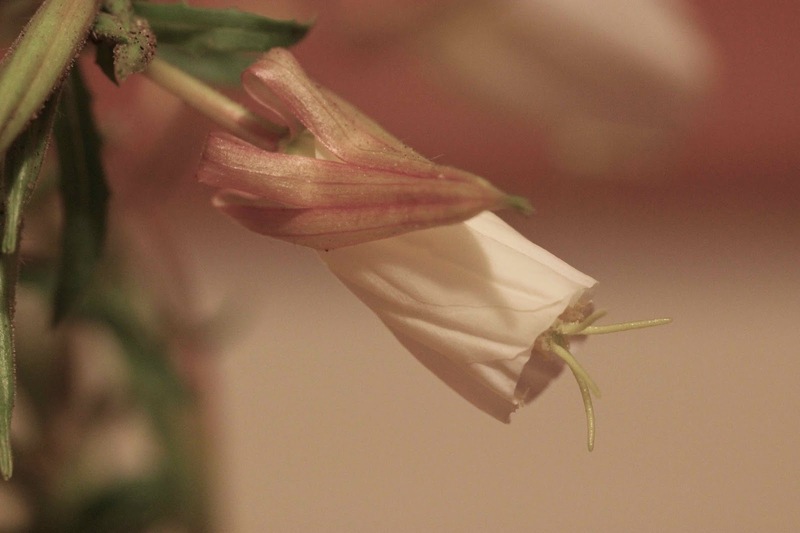 Keeping the stigma beyond the anthers discourages self-pollination. 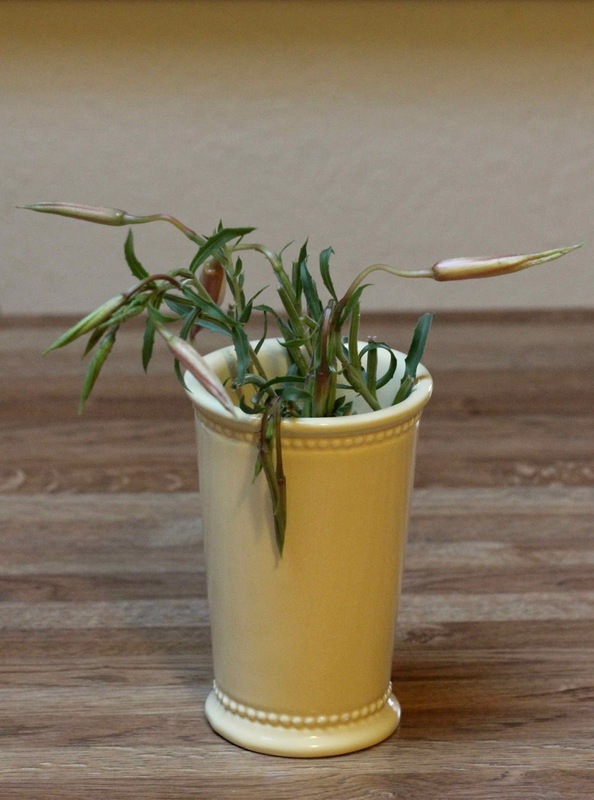 Finally starting to wilt. But the stigmas are still out there waiting for pollen. 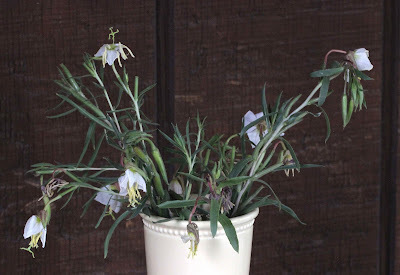 I had read that some evening primrose flowers open very quickly, so I collected stems with buds, hoping to catch them in the act. I put them in a vase in the kitchen. Drooping slender buds looked too young. Plump ascending buds looked more promising. Surely these are ready to bloom! The calyx of one of the buds had split, providing a glimpse of carefully packaged petals with green stigma lobes at the tip. At 7:30 I turned off the lights and opened all the windows, bringing the cool dimness of dusk to the kitchen. I took up watch, reading by headlamp, but for an hour I noticed nothing. At 8:35 I let the dog in, and returned to that strong distinctive fragrance—a flower was fully open! These evening primroses are fast indeed. Soon others followed. 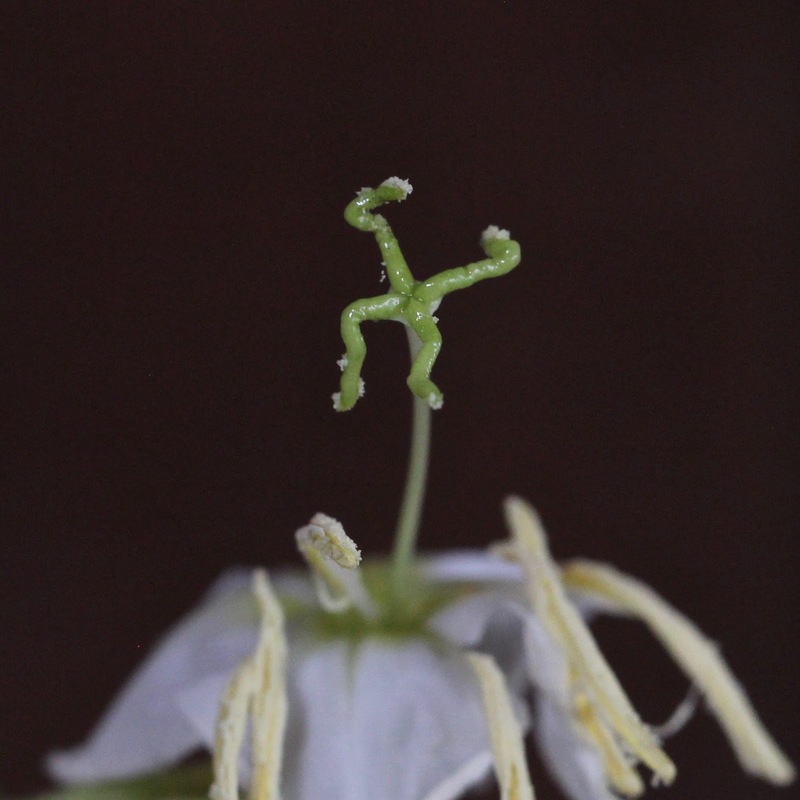 8:42: Splits develop in the calyx, stigma lobes emerging. 8:42.5: Calyx folded back, petals are starting to unfurl. 8:43: Petals continue to spread and unfold. 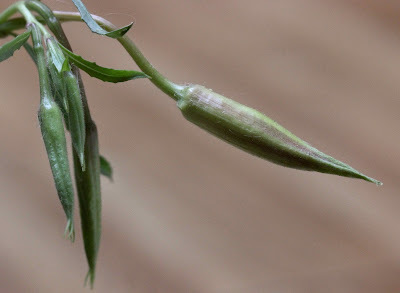 At 8:44, I heard a faint but definite “pop”—a third flower had literally popped open! This one wasted no time. Petals spread and unfold. 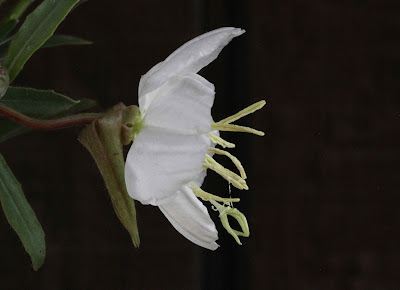 Fold lines remain visible until flowers close the next morning. By 8:50, when I turned off the camera, four flowers had opened, and were filling the kitchen with their thick distinctive scent. I moved them outside and wished them the best. Floral scents are complex. Sometimes only a single compound is involved, but more often there are 20 to 60, or even 100 (Knudsen & Gershenzon 2006). Raguso and his colleagues have identified 16 volatile compounds in Nuttall’s evening primrose. The majority, about two-thirds of all emissions, are really foul-smelling nitrogen-bearing compounds. 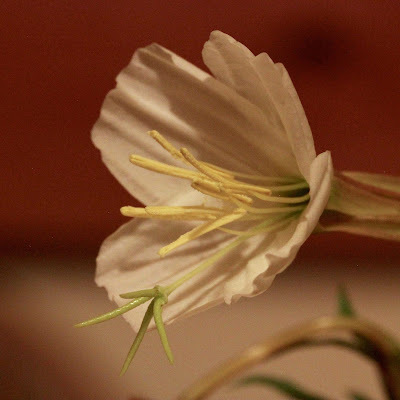 Yet to me, these evening primroses smell sickeningly sweet at worst, and only when they're confined to a small room. Which pollinators find this blend irresistible? Moths. The Raguso lab is currently studying responses of hawkmoths to compounds released by Nuttall’s evening primrose. 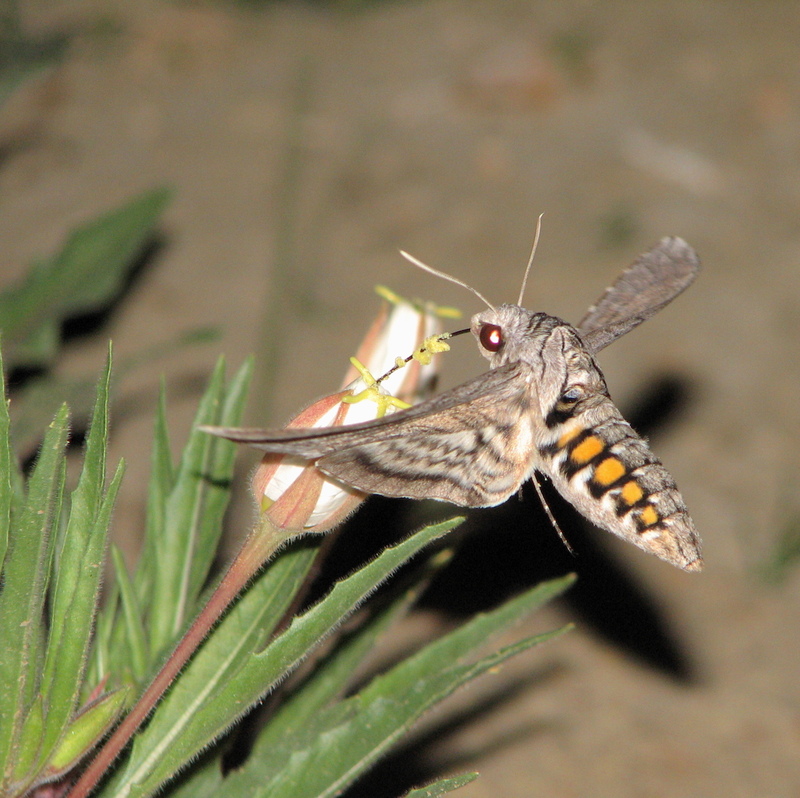 Krissa Skogen has shown that the hawkmoths that pollinate Harrington’s evening primrose will travel up to twenty miles in a night. Do equally wide-ranging hawkmoths pollinate Nuttall’s evening primrose? If so, the required outcrossing is almost certainly assured! 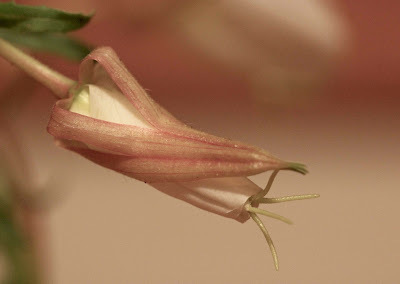 A receptive stigma extended well beyond the anthers, waiting for pollen from afar. Many thanks to Rob Raguso, Professor and Chair of the Dept. of Neurobiology and Behavior at Cornell University, for sharing his research results for Nuttall’s evening primrose. 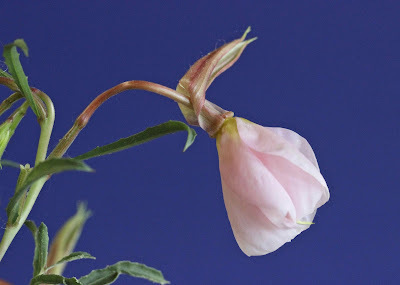 Krissa Skogen of the Chicago Botanic Garden provided the great photo of the hawkmoth and evening primrose. 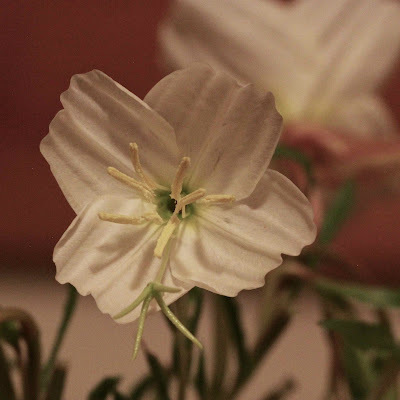 For more about her research on hawkmoths and Harrington’s evening primrose, see Science Scents. Knudsen, JT, and Gershenzon, J. 2006. The chemical diversity of floral scent, in Dudareva, N, and Pichersky, E, eds. Biology of floral scent. CRC Press. “Forest” on Hutton Lake, next to pale sandstone outcrops. Pattern on lake is windblown waves. Intent on following my serviceberry tree, neglected since March, I returned to the unexpected forest at Hutton Lake—trees growing where there "shouldn’t" be any. Off to see my serviceberry. 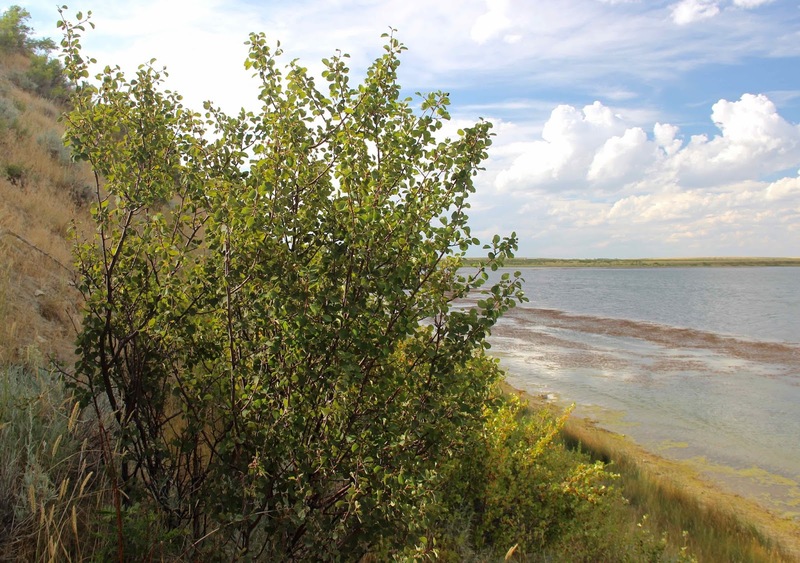 The Hutton Lake Forest is the patch of trees on the steep slope across the lake. Hutton Lake lies in the southern Laramie Basin, in southeast Wyoming. 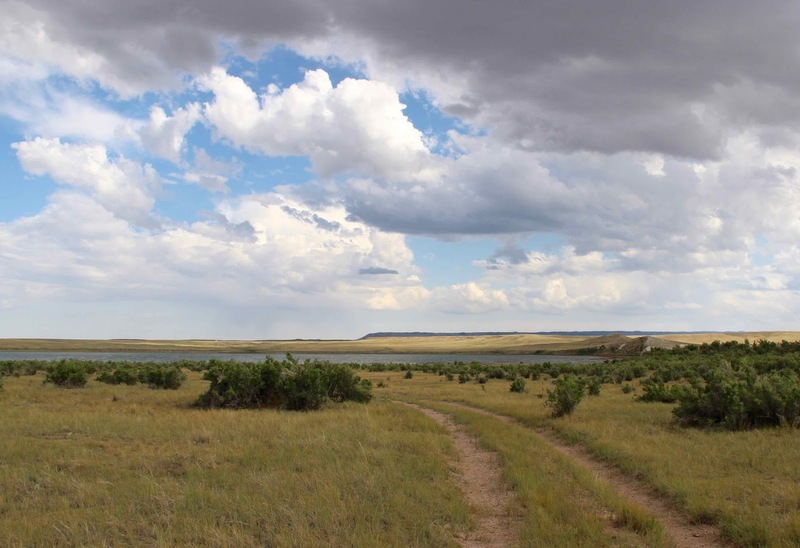 To the east are the Laramie Mountains; the Medicine Bow Mountains lie to the west. The result is a double rain shadow, with the Laramies sucking moisture out of summer storms coming from the plains, and the Medicine Bows doing the same for winter storms from the west. 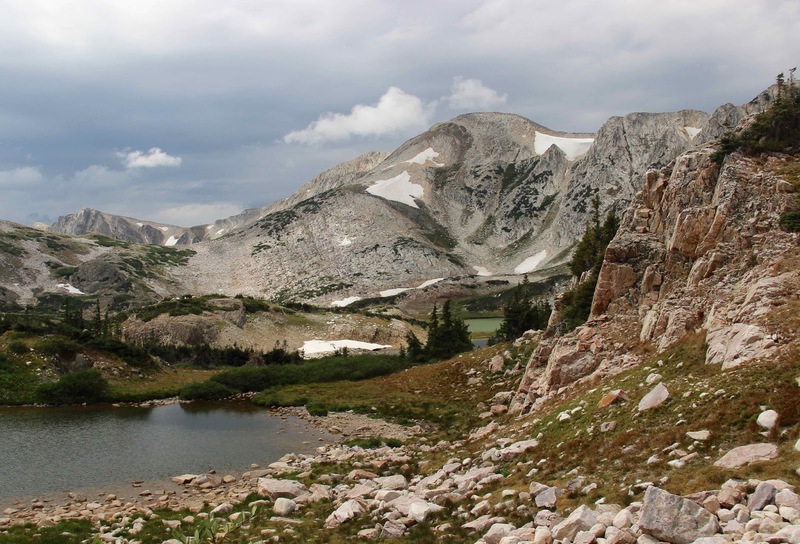 The Basin receives only 11 inches (28 cm) of annual precipitation on average—not conducive to forests. Cottonwoods line the rivers, but the rest of the Basin is covered in grass and shrubs. 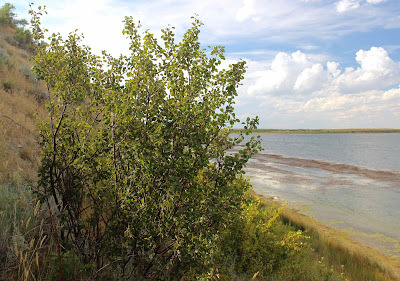 Yet on the south side of Hutton Lake stands a charming little forest, with two narrow leaf cottonwoods (Populus angustifolia), a patch of aspen (Populus tremuloides), and about twenty serviceberries (Amelanchier sp. 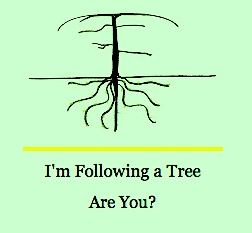 ), four of which I consider small trees, being taller than 65 in or 1.65 m (my height). 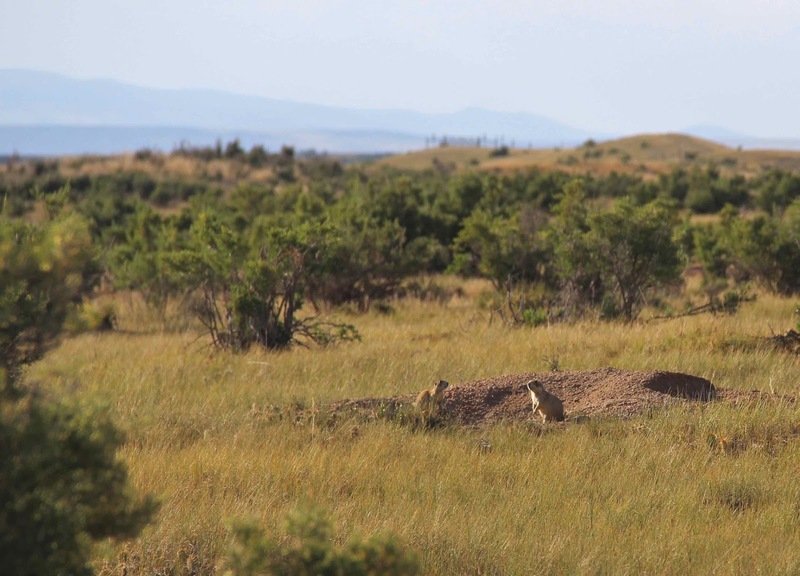 All are growing in a narrow zone less than 100 m long on the northeast slope of a small ridge. Narrow leaf cottonwood on a windy evening (windy is normal here). Looking down into the aspen grove. 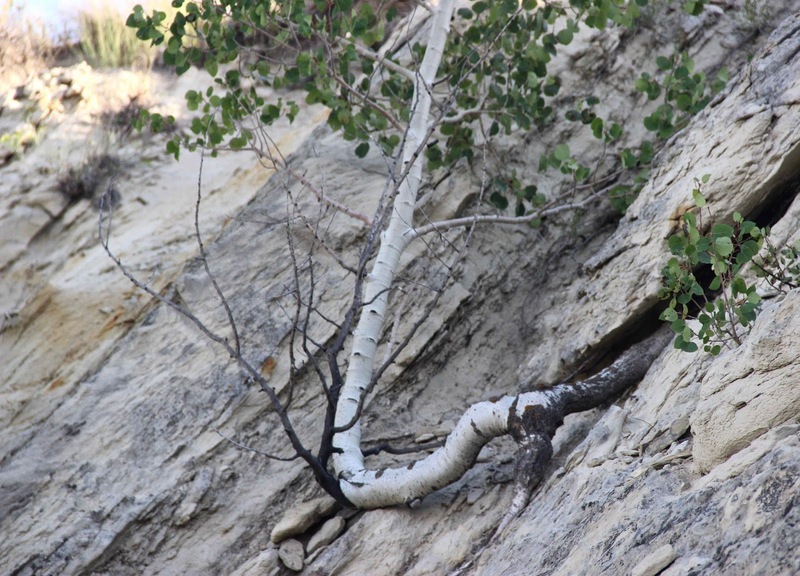 The tilted rocks are a clue as to why these trees are here. 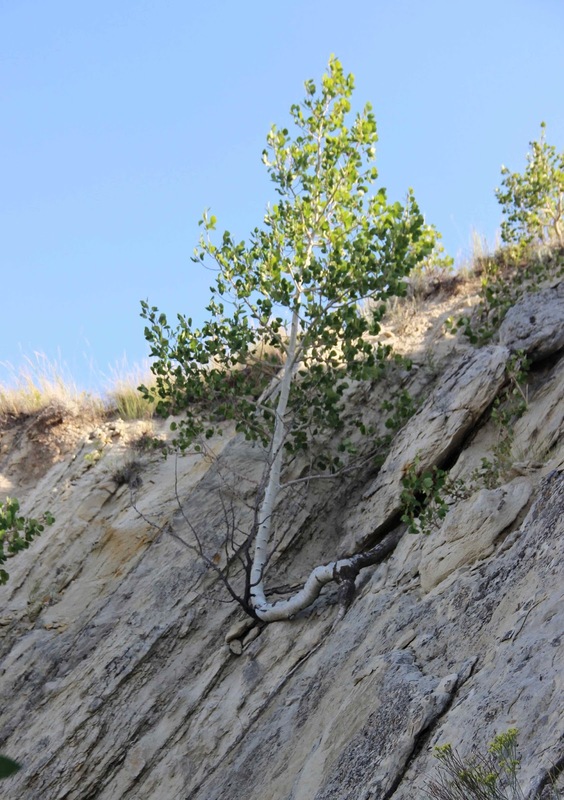 This aspen and several smaller ones nearby are growing out of cracks in the sandstone. 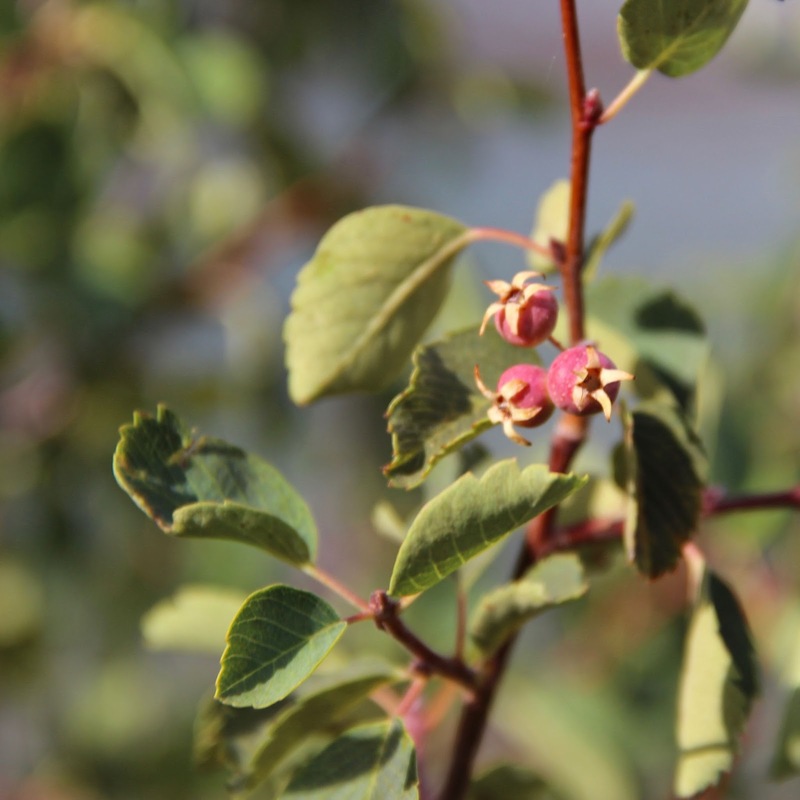 The serviceberry tree that I photographed last March, when it was leafless, is now easy to identify, with its distinctive leaves and fruit. In spite of the wind, some of these leaves ended up in focus. Click on image to see the distinctive oval leaves with obvious veins and toothed margins. 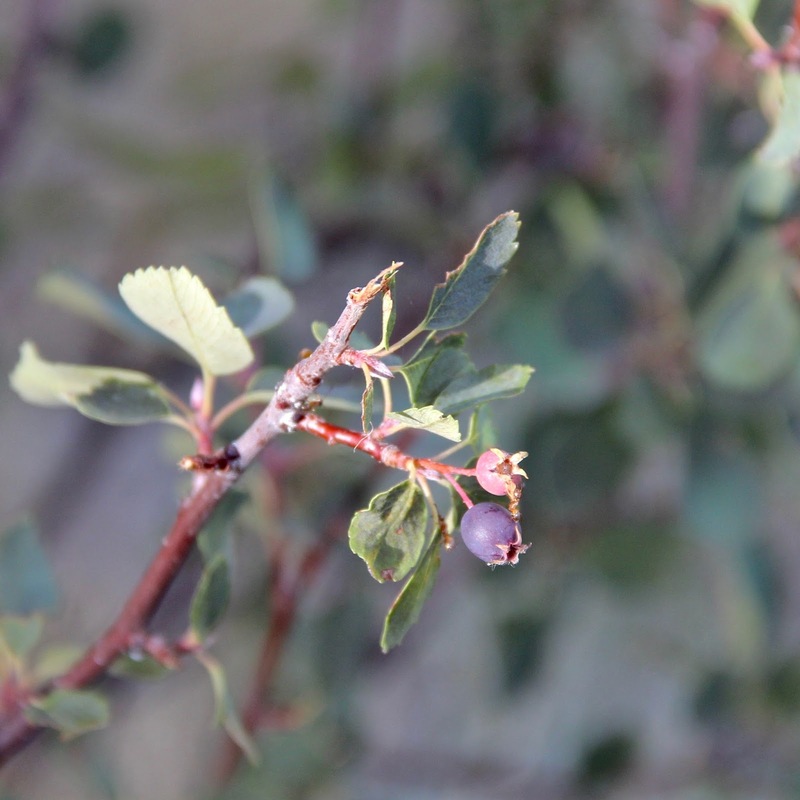 The berries look like little apples, not surprising given that apples and serviceberries are in the same subtribe of the Rose family (Malinae in the Rosaceae). None were ripe, but some were getting close. 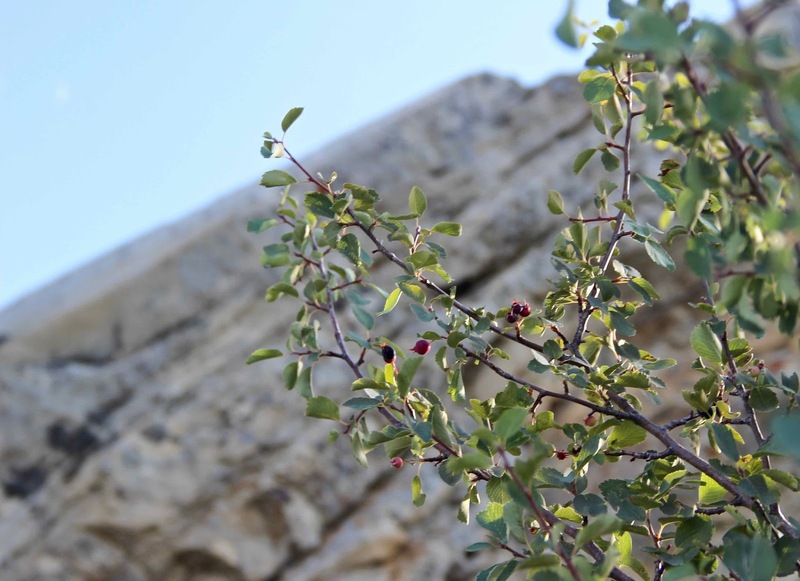 “Serviceberries (Amelanchier spp.) 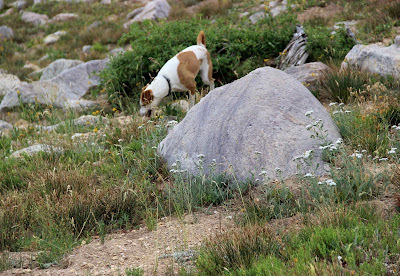 intergrade and hybridize readily, making species identification difficult” (USDA Forest Service). “Identification is best undertaken in the field, with visits during flowering and fruiting seasons, and observations of habitat, habit, presence of congeners [related species], and flowering time relative to sympatric congeners” (Flora of North America). Sigh. Maybe I will look into this for a future post, but for now there are much more interesting things to ponder … like the ant hordes. 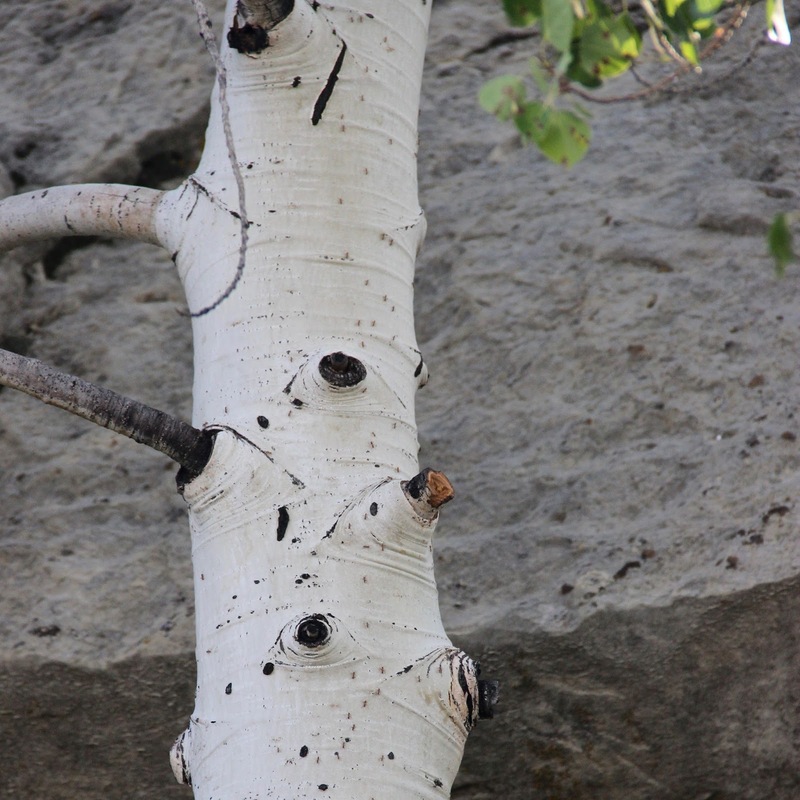 Little brown dots winding up the right side of the aspen trunk are ants (click on image to view). There were ants everywhere!—on sandy ground, on sandstone rocks, on aspen trunks growing out of the rocks, and on my bare legs. Fortunately they didn’t bite, but they swarmed up my legs whenever I stopped to take photos and notes. Why so many ants? Why trees? Maybe the reason is the same—a fold in the land. When the Laramie and Medicine Bow Mountains were uplifted via massive folds and faults, about 60 million years ago, minor folds were created in the downwarped basin. 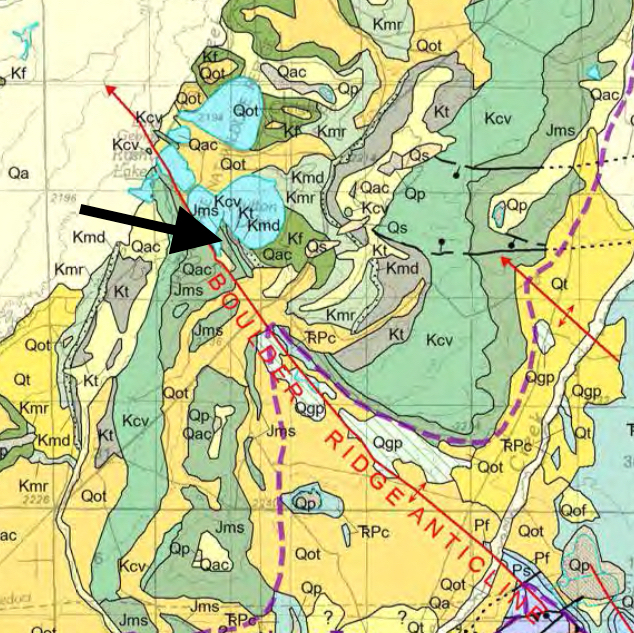 Hutton Lake lies on the northeast side of such a fold—the Boulder Ridge anticline. 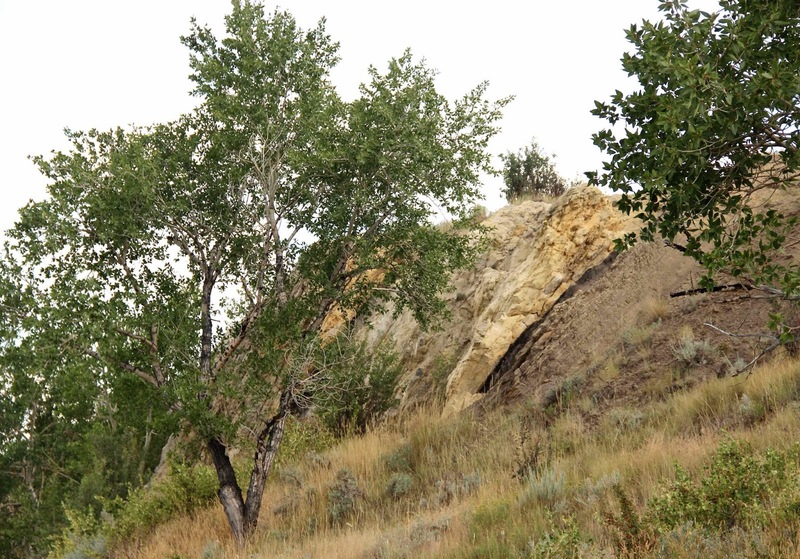 Steep northeast limb (side) of Boulder Ridge anticline. Steeply-tilted Muddy Sandstone (lower Cretaceous) behind narrow leaf cottonwood. 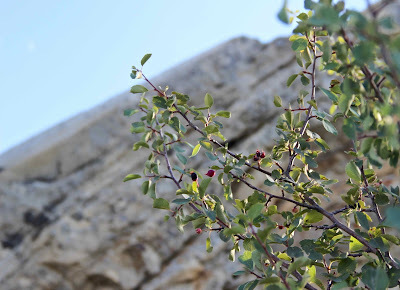 Front to back: golden currant, serviceberry, Muddy Sandstone, aspen. It’s not unusual to find trees associated with rocks in an otherwise unforested landscape. Perhaps there are suitable microenvironments where seedlings were able to grow in the absence of competition from grasses and shrubs. Perhaps there’s more moisture here, from snow drifts, or rain running off tilted rocks. 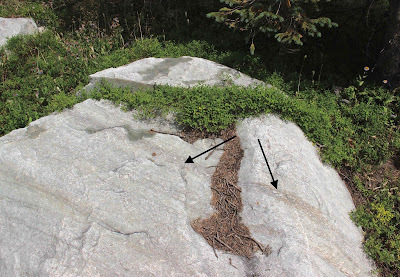 We known that fractures in bedrock serve as reservoirs, funneling and storing water that can be accessed by roots. As for the ants … well … I don’t know why they were so abundant on the loose sandy soil. Maybe it makes for better burrows. 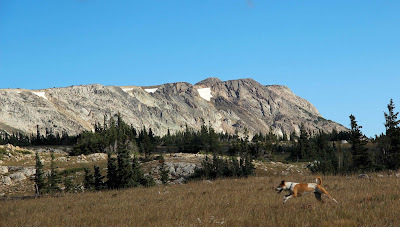 In any case, it appears that they also benefit somehow from the folded rocks of the Boulder Ridge anticline. Walking back to the car, through the din of complaining prairie dogs, I thought about the little forest and how it came to be. How did seeds manage to land in that little patch of hospitable habitat? How did they hit such a small target? 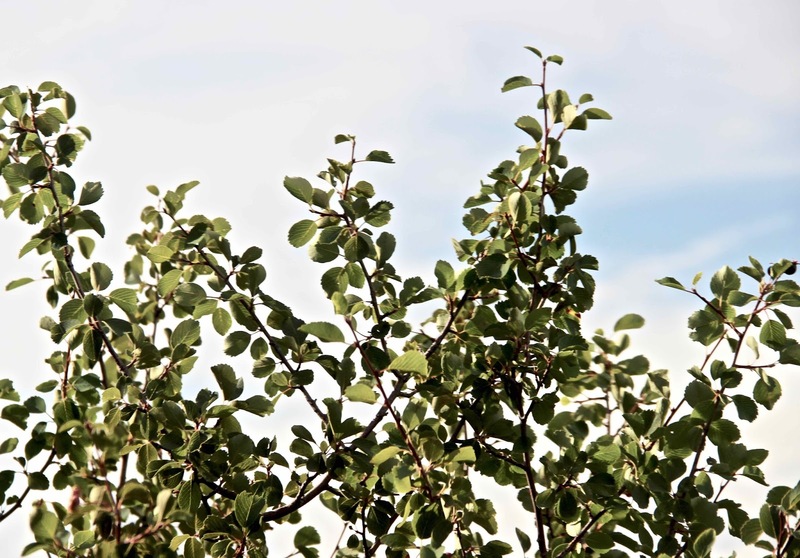 Serviceberry, aspen and cottonwood must cast many seeds far and wide—so many and so far that a lucky few will land in just the right place, even if it’s tiny. 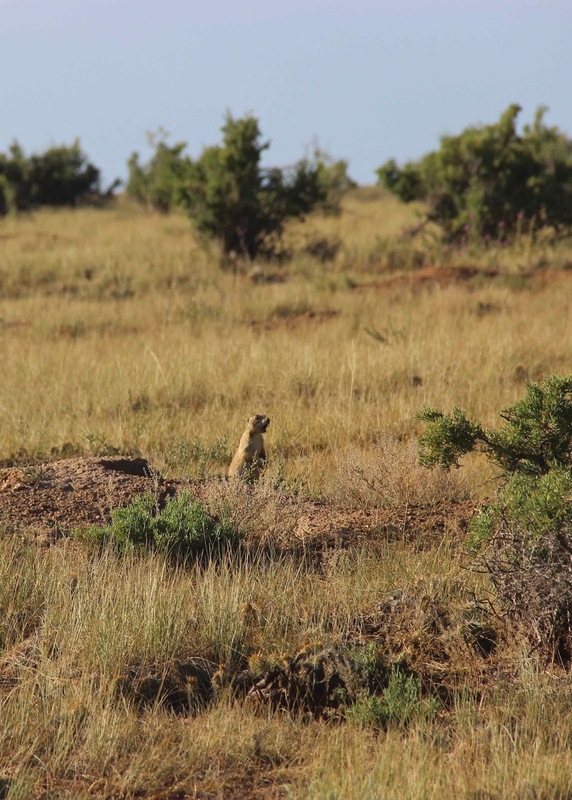 White-tailed prairie dogs are summer company at Hutton Lake. To warn their neighbors of invaders, they chatter and cry loudly … until the invader gets too close at which point they quickly disappear down their holes. Monthly virtual gatherings of tree followers are kindly hosted by The Squirrel Basket. 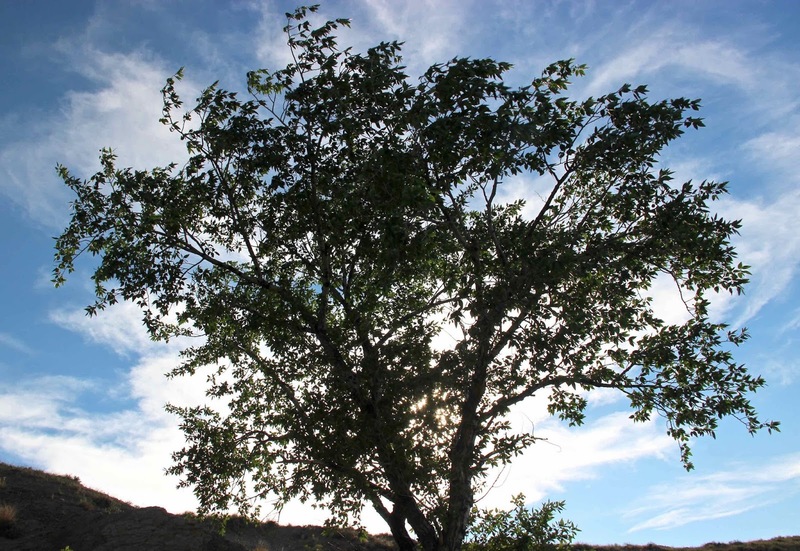 Find tree news from around the world here. Darton, N.H., and Siebenthal, C. E., 1909, Geology and mineral resources of the Laramie Basin, Wyoming: U. S. Geological Survey Bulletin 364. Knight, DH, et al. 2014. Mountains and plains; the ecology of Wyoming landscapes, 2nd ed. Yale University Press. Ver Ploeg, A.J., Larsen, M.C., Taboga, K.G., 2016. Characterization of evaporite karst features in the southern Laramie Basin, Wyoming. 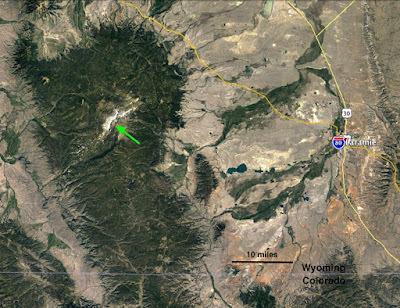 Wyoming State Geological Survey Report of Investigations No. 70, 34 p.